Brrr….It’s a crazy windy day out there. 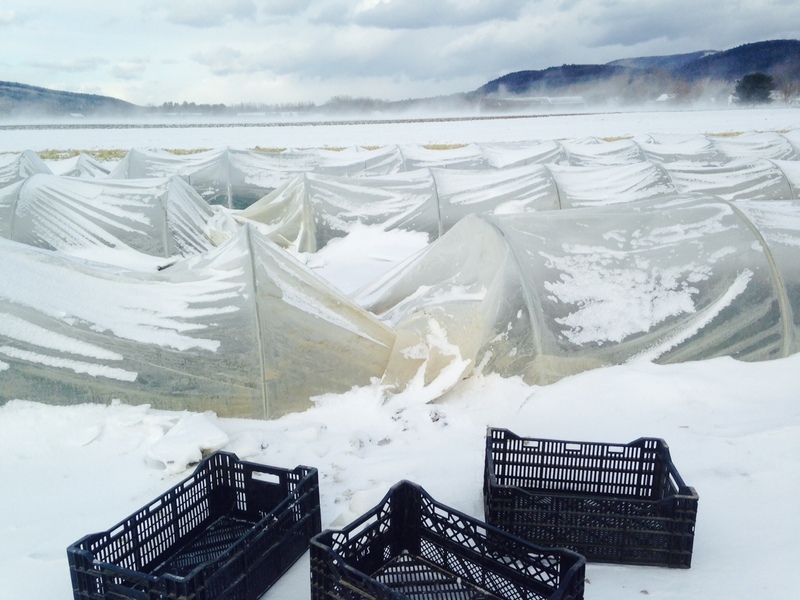 The upside might be that some of the snow from this past week will be blown off of the low tunnels at Riverland so that there aren’t mountains to dig into come harvest day this week. Remember these photos from last month’s share blog? Well just imagine what the tunnels look like after last week’s storm! Anyways…this weather makes me happy to stand at the warm stove and cook. I just got Jackie Starr’s Fabulous Menu Suggestions for our share this upcoming week. Check it out! There’s even a sweet potato felafel in there and lots of other inspiring ways to enjoy the winter veggies. Here are the shared contents (and storage/use advice) for this upcoming Saturday, barring any major weather-related difficulties. Cabbage (red), from Riverland— sauerkraut or kimchi ideally is made asap, cabbage will store for a while whole, just peel off outer leaves that may have dried a bit or turned brownish/blackish–the rest of the cabbage will still be quite good. Dried Thyme-bouquet, from Picadilly–great for adding to those hearty winter stews and soups! Sweet potatoes 4 lbs., from Riverland and Picadilly–for a quick and easy snack anytime, make sweet potato fries in the oven (with a little chili powder and cumin!) or sweet potato ice cream! Dried Beans, (choice of black turtle, light red kidney, cannelini, or sulfur yellow), hand sorted from Baer’s Best Beans will keep for the next year in dry storage, cold or warm. As they are fresher now, they typically take less time to cook and need minimal soaking. Tomato Puree (1 jar), Riverland’s summer tomatoes, pureed and canned by local processor, shelf-stable, no salt added. 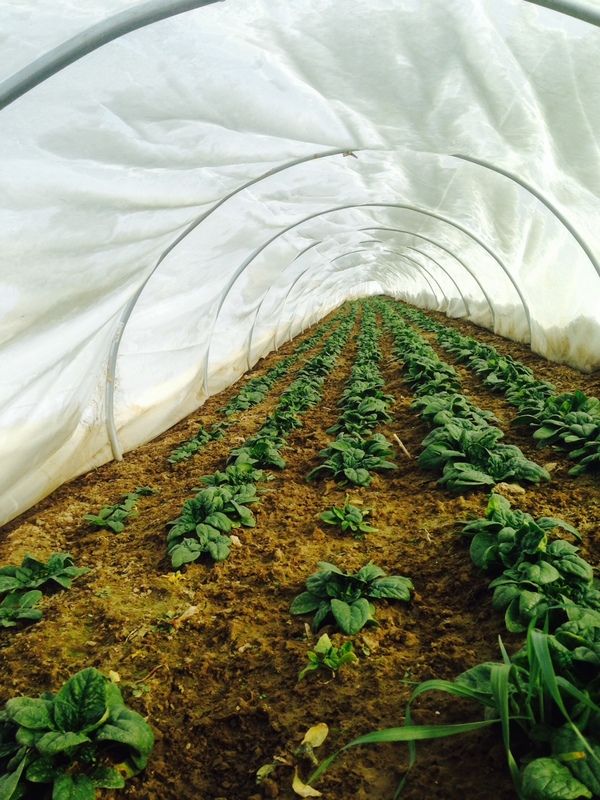 ← Deep Winter Share–fresh picked spinach! Just a note to all to check your squash carefully. Today one of mine was split and rotten. Oh, I am sorry to hear that. Squash can store well, but it’s not 100%. Often, if you catch a brown spot early, you can peel, cut, take out the rotten part, and the rest is good to either use immediately or cut and freeze for later use in a soup. So, yes, please do check your squash after you get it and periodically during storage. Cindy, let me know if I could get you a nice one. I have more that are in good shape.